Immunity is a defence mechanism that recognizes and learns unknown and diverse foreign enemies to promptly initiate a respose for their elimination. This recognition and learning are realized by the diverse repertoire of B and T cells in the body. 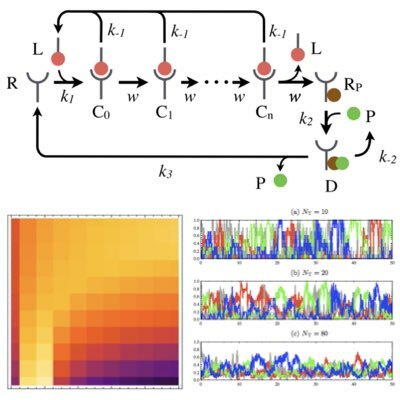 We combine a modeling of immune cell dynamics with the high throughput sequencing of immune cell diversity to clarify how the individual immune status (i.e., the number of cells and their diversity) is maintained and controlled dynamically and homeostatically. The diversity of immune cells is essential for the adaptive immune system to recognize the huge variety of unknown foreign antigens. Thus, decoding this immuno diversity is a pivotal step towards understanding the mechanism by which the immune system can learn and adapt to different environments with different pathogens. 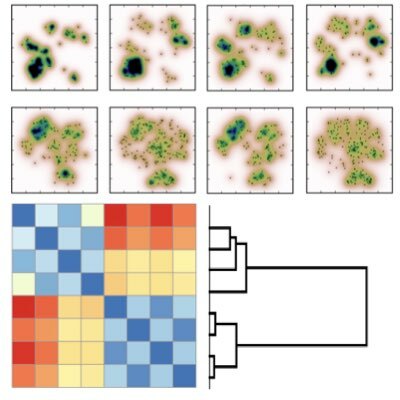 To extract such information from high-throughput sequencing data of T cell receptors (TCRs), we have proposed a dimensionality-reduction-based method for TCR repertoire analysis, which enables the comparson of different TCR repertoires and can lead to identification of subpopulations of TCRs that have a dominant contribution to establishing the difference between repertoires. This method can be applied to clarify how the TCR repertoire changes before and after various physiological perturbations such as infection, stress, and aging (Learn more). Homeostasis is a representative characteristic of the immune systems. 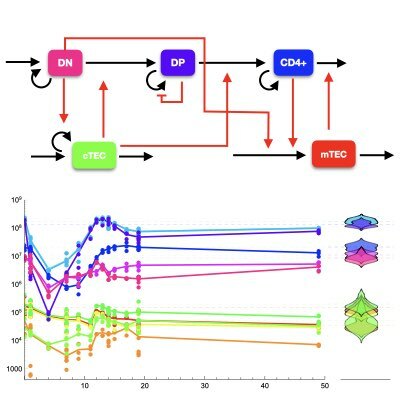 We used the thymic development of T cells as a model system to investigate the homeostasis of T cell generation by combining quantitative data and mathematical modelling (Learn more). 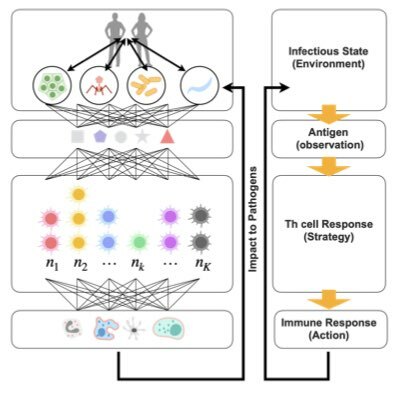 Adaptive immunity is a naturally developed learning system, in which appropriate responses to foreign antigens are adaptively learned via sequential encounters with antigens from different pathogens present in the environment. Despite the progress in understanding the immune system itself, the learning mechanism underlying adaptive immunity is still limited to only a qualitative understanding. To establish a quantitative understanding of immuno-learning, we are constructing mathematical models that can capture the most fundamental aspects of the learning processes.